Hello everyone, I decided I’d do another ‘Spring’ themed post since the last one went down so well. 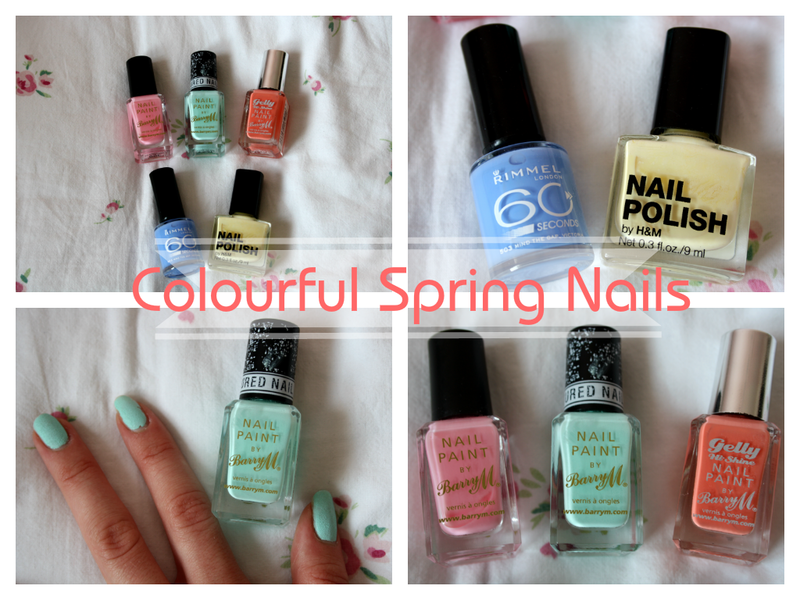 I’ve got 5 nail varnishes that I think are perfect for the spring/summer time. And they are..
My favourite out of the 5 has to be the barrym textured nail paint in ridley road. The colour is so gorgeous and seems to go with whatever you’re wearing. You don’t even need a top coat with this nail varnish, it stays put all by itself. I would really recommend this for anyone looking for a bright summery colour that wants it to last for a while. My second favourite out of these has to be the barrym gelly nail paint in papaya. I’m sure many of you will have the gelly nail varnishes by barrym, or at least heard of them. They really are amazing, there is no need to put a top coat with this either, as the finish is so perfect. The colour of this is so tropical and fruity, hence the name ‘papaya’, which is perfect for the upcoming spring/summer months. Next I’m going to say the rimmel london 60 seconds nail polish in mind the gap, victoria. It fits the theme of spring, with its sky blue colour, you can’t go wrong with this. This does dry off pretty quickly, and the finish is lovely, I think you’ll probably need a top coat with this just to make sure but you have to do that with most nail varnishes anyway. Second to last has to be the H&M nail polish in want a lemon. Now I couldn’t find this online but I’m pretty sure they still have it in the shops. I got this last summer because of how pretty it is and I really wanted a yellow nail varnish and this seemed to do perfectly. Its a really happy spring/summer colour. Last but not least, the barrym nail paint in strawberry ice cream. Don’t get me wrong, I do love this colour however it takes quite a few coats to get it looking opaque. Also the colour doesn’t stay on for that long, so you’ll probably need a base coat and a top coat. Anyway, it is a really sweet spring colour and perfect for the sunny weather we’re having. I hope you enjoyed reading, please comment if you purchased any of these or already have them. Also leave a comment on what else you’d like to see on my blog as it helps me out a lot, thanks for reading!